The Offshore Pump produces Water from a lake or ocean. It must be placed on a shoreline of a body of water on the map, and connected to a pipe or other object that accepts liquids. It produces 1200 units of water per second. It does not require electricity or fuel to operate. Offshore Pumps are frequently used to provide water for Steam engines, though several crafting recipes also require water. 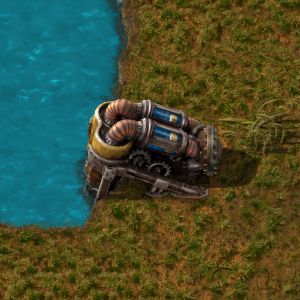 As of 0.15, one offshore pump can generate enough water to support 20 boilers, which in turn can support 40 steam engines. For more information, see Power production. The water supply from an offshore pump is endless; it will not dry up the body of water it is attached to (to do that, use Landfills). Additionally, the size of the body of water the pump is connected to does not affect the rate of water generation. Copy paste now works on pump. Connectable to the circuit network. Now specifies the liquid it will produce.